As a pioneer in the development of high-precision 3D surface imaging technology, 3dMD offers a range of 3dMD temporal-based (4D motion) systems to document and quantify anatomical dense surface movement, function, pose, and expression. The first-generation of ultra-fast temporal-3dMD systems were commercially available in 2005. These systems enabled researchers to capture an ordered sequence of 3dMD images over a period of time at rates of up to 60 Hz (3D frames per second), which advanced the study of dense surface deformations such as skin flow to submillimeter anatomical-precision. 3dMD customers were able to better quantify human interaction with an inanimate object (clothing, instruments, etc. ), as well as start inferring internal behaviors (skeletal, respiratory, etc.). Moreover human interaction between two subjects was easily documented and measured when multiple temporal 3dMD systems were synchronized. The next advancement occurred with the delivery of the world’s first temporal-3D dense surface full body performance capture system to the Max Planck Institute in Tübingen, Germany (MPI). This forward-thinking 3dMD customer required true anatomical-3D documentation of soft tissue behavior, which to date had not been possible with the traditional marker-based motion capture (MoCap) systems. With the temporal 3dMDbody22.u System, the MPI research team is able to examine a dynamic series or individual 3dMD frames to derive their optical flow and shape-class deformation algorithms. As a result of the technology innovation delivered to the Max Planck Institute and after a series of customer trials, 3dMD introduced its latest generation image capture software platform and product architecture in January 2016. 3dMD’s latest platform provides a robust foundation for its complete line of static- and temporal-3D products to support future upgrade paths to rapidly advancing research requirements by increasing system frame rates and system coverage to accommodate new and evolving subject performance routines. Today 3dMD’s range of temporal-3D systems incorporate a non-intrusive, LED-based lighting system that promotes eye-safety and subject comfort; eliminate the need for any special surface makeup or preparation; and minimize distraction stimuli to promote the most natural performance from a subject. Never before has there been an opportunity to objectively quantify the anatomical movement and expression of adults, infants, and even restless children, of all skin tones in a natural, non-obtrusive environment. Each 3dMD frame is rendered separately and maintains a consistent accuracy to ensure no jitter on the resultant 3D soft tissue models. Elimination of jitter allows a smooth sequential playback with integrity building a platform for highly sophisticated dense motion analysis of the resultant surface deformations. 3dMD’s temporal-3D range of systems include the ultra-fast 120 Hz (3dMD.u) system series for use in a R&D lab and/or corporate innovation center and a practical 10 Hz (3dMD.t) system series for use in a busy clinical and/or retail environment. 3dMDface.u System: Single 3D image or up to 60 3D frames per second for several minutes of capture at highest resolution. 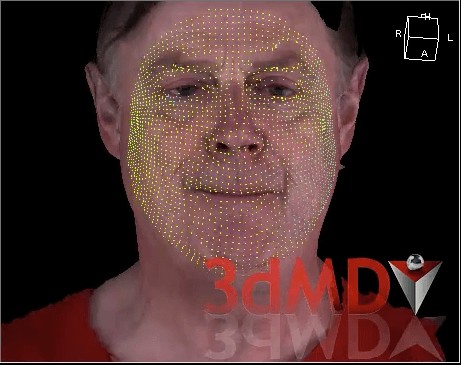 3dMDface.t System: Single 3D image or up to 10 3D frames per second for several minutes of capture at highest resolution. 3D Surface Mesh Integrity: Automatically generates a continuous 3D polygon surface mesh with a single x,y,z coordinate system from all synchronized stereo pairs. No stitching of images required. 3dMDhead.u System: Single 3D image or up to 60 3D frames per second for several minutes of capture at highest resolution. 3dMDtorso.u System: Single 3D image or up to 60 3D frames per second for several minutes of capture at highest resolution. Designed to provide more 3D surface coverage for clinics that have patients who require breast reconstruction and/or breast reduction procedures. 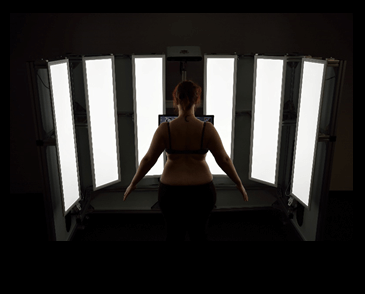 Similar to 3dMD’s custom 3dMDtorso System at the University of Texas MD Anderson, 3dMD has the capability to build a custom set-up that meets the customer’s specific capture requirements. 3dMDthorax.u System: Single 3D image or up to 60 3D frames per second for several minutes of capture at highest resolution. 3dMDbody.u System: Single 3D image or up to 120 3D frames per second for several minutes of capture at highest resolution. 3dMDfoot.u System: Single 3D image or up to 120 3D frames per second for several minutes of capture at highest resolution. 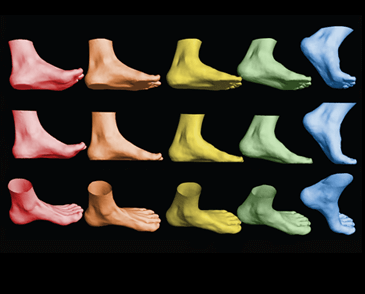 Subject Capture: Generates a series of 360-degree foot models (including the sole) over a period of time. 3dMDhand.u System: Single 3D image or up to 60 3D frames per second for several minutes of capture at highest resolution. 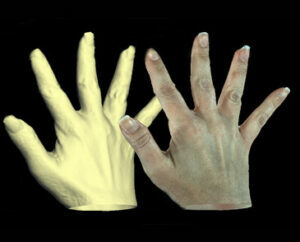 Subject Capture: Generates a series of 360-degree hand models over a period of time. In addition to providing a playback sequence of individual 3dMD frames each with full integrity, the 3dMDtempus Software enables both discrete and ultra-dense analysis techniques of the subject’s skin dynamics with posture, pose, and functional movement. The user simply defines the anatomical regions of interest, or xyz points, to track through the sequence on the 3D surface of a single 3dMD reference frame and the 3dMD software will generate a coordinate map throughout the sequence within a correct temporal context. The 3dMDtempus Software provides the bridge between automated traditional point tracking and sparse meshing techniques to expressing movement in terms of dense surface deformation and classification enabling a new paradigm of tools which permit comparative regional behavior to be enumerated. Feature points to track can be uniformly sampled, detected for generic facial features, or defined by a mesh mask. This capability enables a user to quantify and model the essential subtleties of human behavior and/or reactions to stimuli. The 3dMDtempus Software generates thousands of individual surface points to be transitionally tracked as xyz coordinates from one 3dMD frame to another in six degrees of freedom within the context of the subject’s yaw, pitch, and roll movements. 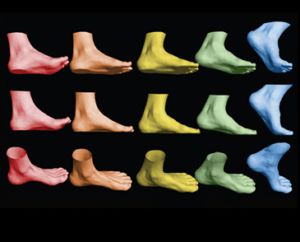 This level of anatomical tracking precision enables clinicians and researchers to accurately measure and quantify anatomical function, expressions from extreme to micro, and soft tissue deformations in a sequence or isolated.